Crafts are sure to get the family in a festive mood this Easter, but there is plenty of DIY fun that can happen in the kitchen this holiday. 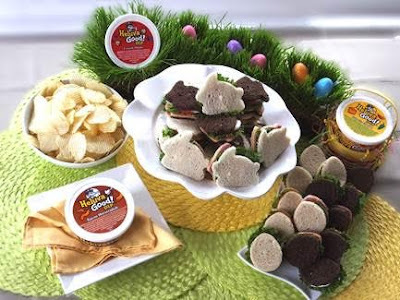 If you’re looking for a creative snack that’s available for the entire family, reach no farther than a cookie cutter-- Easter is the perfect time to take out the Bunny-shaped cookie cutters and involve the whole family in making simple, fun, and festive sandwiches. If you’re looking for a creative way to dress up your holiday ham or wondering what to do with your leftovers, Heluva Good! has created an easy Easter Bunny HAM-wich recipe, which you can top with your favorite dip. Heluva Good! Dips are made with real sour cream and flavorful spices, so flavors such as French Onion, Buttermilk Ranch, and Bacon Horseradish will these DIY sandwiches a deliciously bold flavor. Place a slice of ham and a slice of Heluva Good! cheese between the slices of bread. Cut through all the layers with a bunny or egg shaped cookie cutter. Remove the top piece of bread, add a piece of leaf lettuce and a slice of roma tomato. Top with a 1/2 tsp of Heluva Good! dip, place the top of the bread back on the sandwich and serve.